Three generations of Phi at Commemoration Dinner. 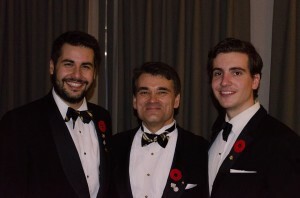 Left to right: Charlie Madon, Elder Phi; Barth Gillan, Phi Alpha; Marco Peghini, Active Phi. On saturday November 15th 2014, over 120 Zetes from around the world gathered in Montreal to pay respects to the veterans who have sacrificed so much to maintain our freedom. Brothers gathered at the Black Watch Society of Montreal for a dinner and ceremonies that included a reading of In Flander’s Fields, reading the names of the Alpha Psi brothers we lost in WWI and WWII, a moment of silence, as well as the annual war-dead presentation. This presentation highlights the lives of two brothers who passed away in the war. Following the dinner, everyone went to the Montreal Racket Club for a night of traditional Zete activities. This event is well-loved by all the active brothers as it gives us all a chance to connect with the Elders. In particular, we were extremely happy to have members of the Alpha Class present to share stories of re-activation.